PORT ANGELES – No people were injured in a house fire at a home east of Port Angeles. The fire Tuesday at 131 Pristine Lane claimed the lives of two dogs and a cat. Officials say the house is a total loss. 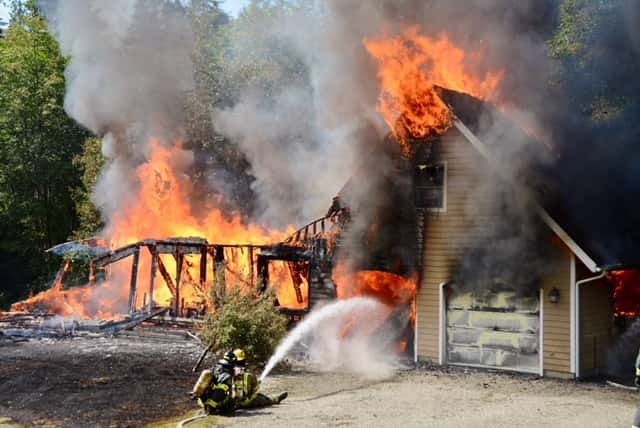 The house was fully engulfed when Fire District Three crews first arrived at 3:15 PM. Firefighters from Districts 2 also assisted with the fire. Crews had it under control by 4:30, but kept watch overnight. The family is reportedly staying nearby with other family members as investigators look into the cause of the fire, though officials say foul play is not suspected.